Hyaluronic acid is a hygroscopic macromolecule formed by the polymerisation of glucuronic acid and N-acetylglucosamine disaccharide. It is a primary component of the extracellular matrix in various body tissues. Ihe use of topical Hyaluronic acid in the treatment of oral ulcers has been recently reported. This article reviews the mechanism of action, indications and efficacy of topical Hyaluronic acid gel in the management of oral ulcers. 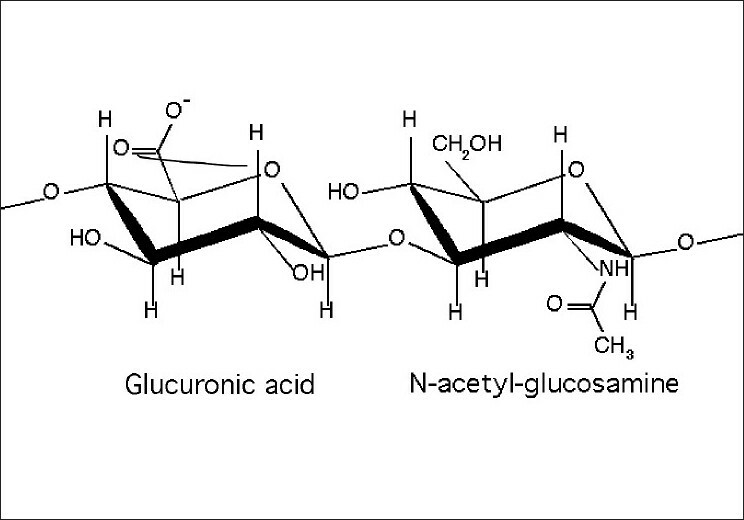 Hyaluronic acid (HA) is a linear polymer of glucuronic acid and N-acetylglucosamine disaccharide. The main function of HA includes tissue healing including activation and moderation of the inflammatory responses, promotion of cell proliferation, migration, and angiogenesis. It also promotes re-epithelization via proliferation of basal keratinocytes. 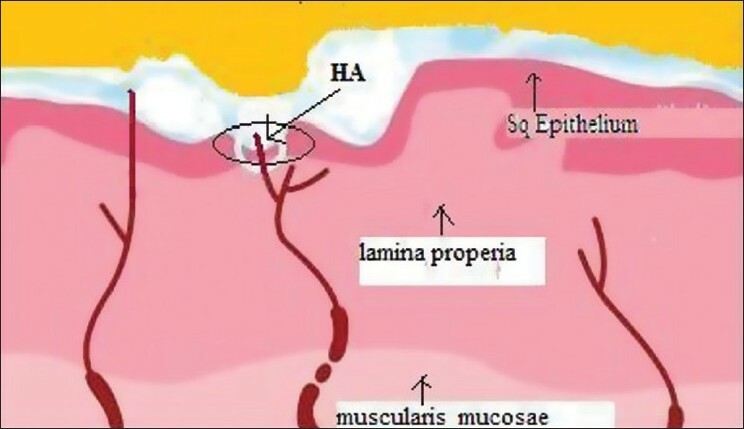 HA is a hygroscopic macromolecule and its solutions are highly osmotic. In the oral mucosa, this property enables to control of tissue hydration during periods of inflammatory process or response to tissue injury resulting in ulcer formation. High-molecular-weight HA [Figure 1] acts as an anti-inflammatory molecule and has been shown to be beneficial in supporting gingival health. It is the most abundant high-molecular-weight glycosaminoglycan (GAG) in the extracellular matrix of soft periodontal tissues. Studies indicate that HA exhibits beneficial anti-inflammatory and antibacterial activity in the treatment of gingivitis and periodontitis. , Topically, HA has been used as a 0.2% solution for the treatment of recurrent aphthous ulcers in clinical trials. , HA is commercially available as sodium hyaluronate in combination with polyvinylpyrrolidone (PVP) and glycyrrhetinic acid. The combination was launched as Gelclair® sachets (Sinclair Pharma, UK Ltd) in 2002 and received US Food and Drug Administration (US FDA) approval for management of oral mucositis associated with chemotherapy. PVP, an important constituent of this preparation, has remarkable properties such as good chemical and biological inertness, very low toxicity, high media compatibility, and crosslinkable flexibility, which gives stability to the formulation. Polyvinylpyrrolidone - It is a hydrophilic polymer with muco-adherent and film-forming properties, which enhances tissue hydration. Hyaluronic acid (as sodium hyaluronate) - It coats the oral mucosa, enhances tissue hydration, and accelerates healing. Glycyrrhetinic acid - It is a breakdown product of glycyrrhizin, the active component of licorice and has anti-inflammatory properties that aid in ulcer healing. It is also used as a flavoring agent. PVP-SH gel is available in 15-ml single-use sachets. The entire contents of the single-dose PVP-SH sachet are dissolved in 40 ml or two tablespoons of water. The mixture is stirred and used immediately as an oral rinse for at least a minute or as long as possible to coat the tongue, palate, throat, buccal mucosa and all oral tissue thoroughly, and then spit out. Depending on the discomfort caused by oral ulcers, PVP-SH gel can be used at least three times per day or as needed. It is advised not to eat or drink for at least one hour following use. In children under the age of 6 years who may be unable to rinse or gargle, the gel can be applied undiluted with a cotton bud. Lee et al,  tested the efficacy of topical 0.2% HA gel on recurrent oral ulcers in 33 patients with recurrent aphthous ulceration or Behcet's disease. The patients were asked to use topical 0.2% HA gel twice daily for 2 weeks. The subjective parameters investigated s included number of ulcers, healing period and visual analogue scale (VAS) for pain. The objective assessment included number of ulcers, maximal area of ulcer, and inflammatory signs, which were inspected by a physician. After 2 weeks, a subjective reduction in the number of ulcers was observed in 72.7% of the patients. A decrease in the ulcer healing period was observed in 72.7% of the patients, and 75.8% experienced improvement in VAS for pain. Objective inspection of the ulcers revealed a reduction in the number of ulcers in 57.6% of the patients, and a decrease in the area of 78.8% of the ulcers was seen. Among the inflammatory signs, swelling and local heat showed significant improvement after treatment. HA 0.2% or PVP-SH gel offers advantages over topical steroids in that it is safe to be used in all patients including infants and pregnant women, in whom there may be reluctance to use steroids. It can be used in all grades of oral ulceration , [Table 1]. The only contraindication is known history of allergy or hypersensitivity to HA or any of the ingredients in the PVP-SH gel. 1. Ialenti A, Di Rosa M. Hyaluronic acid modulates acute and chronic inflammation. Agents Actions 1994;43:44-7. 2. Sukumar S, Drízhal I. Hyaluronic acid and periodontitis. Acta Medica (Hradec Kralove) 2007;50:225-58. 3. Pistorius A, Martin M, Willershausen B, Rockmann P. The clinical application of hyaluronic acid in gingivitis therapy. Quintessence Int 2005;36:531-8. 4. Mendes RM, Silva GA, Lima MF, Calliari MV, Almeida AP, Alves JB, et al. Sodium hyaluronate accelerates the healing process in tooth sockets of rats. Arch Oral Biol 2008;53:1155-62. 5. Nolan A, Baillie C, Badminton J, Rudralingham M, Seymour RA. The efficacy of topical hyaluronic acid in the management of recurrent aphthous ulceration. J Oral Pathol Med 2006;35:461-5. 6. Lee JH, Jung JY, Bang D. The efficacy of topical 0.2% hyaluronic acid gel on recurrent oral ulcers: comparison between recurrent aphthous ulcers and the oral ulcers of Behçet's disease. J Eur Acad Dermatol Venereol 2008;22:590-5. 7. Smith T. Gelclair: Managing the symptoms of oral mucositis. Hosp Med 2001;62:623-6. 8. Buchsel PC. Polyvinylpyrrolidone-sodium hyaluronate gel (Gelclair): A bioadherent oral gel for the treatment of oral mucositis and other painful oral lesions. Expert Opin Drug Metab Toxicol 2008;4:1449-54. 9. Nolan A, Badminton J, Maguire J, Seymour RA. The efficacy of topical hyaluronic acid in the management of oral lichen planus. J Oral Pathol Med 2009;38:299-303. 10. Higuchi Y, Ansai T, Awano S, Soh I, Yoshida A, Hamasaki T, et al. Salivary levels of hyaluronic acid in female patients with dry mouth compared with age-matched controls: A pilot study. Biomed Res 2009;30:63-8. 11. Yuan J, Tohara H, Mikushi S, Hoshino T, Yue B, Uematsu H. The effect of "Oral Wet" for elderly people with xerostomia-the effect of oral rinse containing hialuronan. Kokubyo Gakkai Zasshi 2005;72:106-10. 12. Hita-Iglesias P, Torres-Lagares D, Gutiérrez-Pérez JL. Evaluation of the clinical behaviour of a polyvinylpyrrolidone and sodium hyalonurate gel (Gelclair) in patients subjected to surgical treatment with CO 2 laser. Int J Oral Maxillofac Surg 2006;35:514-7. Di Simone, M.P., Baldi, F., Vasina, V., (...), Ferrieri, A., Poggioli, G.